“Beautiful face. Beautiful body. Horrible attitude. In general, I like to think that I can trust my Goodreads friends, and the people I follow on the site, as well as the BookTubers I watch religiously. So, when there is a book that they all rave about, I know that it is probably one that I need to get my hands on. But, oh how I have been let down this time around. 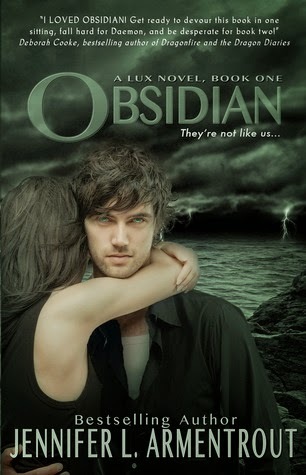 I had heard nothing but good things about Obsidian and Jennifer L. Armentrout's Lux series in general. But, all of those commendations did not hold up for me. I often felt that this book mimicked a very popular book that I read a long time ago (*cough* Twilight *cough*). And, it did so unsuccessfully. Simple and point blank, I felt that the writing in Obsidian was mediocre and watered down. I know that this is a YA novel with a young audience, so the writing does not have to be too elegant, and the standards are not extremely high. We want young people to actually be able to understand what they are reading, right? But, it's okay to challenge them, too--I have come across many YA novels that are beautifully and impressively written. Unfortunately, Obsidian does not fall into that grouping. -1 star. One of the things that I did appreciate about Obsidian was that the main character is a book blogger. Katy is someone that I can definitely relate to -- she posts Waiting on Wednesday blog memes, book reviews, and hauls. I thought that it was neat that Armentrout paid homage to a community that is very important to me. +1 star. Daemon and Katy....to be honest, I just wasn't feeling it. As I already mentioned, the relationship between the main characters of Obsidian reminded me too much of Twilight. I am beyond over the stories about the guy who pretends not to like the girl (being mean and rude to her in order to "protect" her from the truth) but actually does like her. And, then there is the girl who is attracted to him because of his good looks although he is a jerk. I'm just so. freaking. over. it. -1 star. When I read the synopsis for Obsidian, I thought that the book sounded interesting enough. I have never really read anything about aliens or the extraterrestrial before. So, the supernatural element--trying to figure out what Daemon is exactly and what his motivations are--I found to be intriguing. However, the rest of the story felt very "been there, read that". But, while Armentrout could have done a lot more with it, I thought that, overall, the plot had good foundations. +1 star. Daemon is such a stereotypical character personality wise. Even the name "Daemon", usually associated with bad boys (such as Damon Salvatore from The Vampire Diaries), is a little too stereotypical for me. I found it very hard to like Daemon, even after Katy fell in love with him. He was so incredibly rude to her. And, I don't care that he was super hot. I don't care that he was repressing his feelings for her to "keep her safe". I am so over that story line. If I ever read a book where the love story unravels like this one again, I'll probably throw it out the window. -1 star. I have never written such a scathing review before. I feel kinda terrible. But, not nearly as terrible as this book. Maybe this series gets a lot better, but I am honestly not willing to find out. Have you read Obsidian or, even better, the entire Lux Series? Tell me your thoughts! This is a book I own but have yet to really start reading! Like you I have only heard positive reviews about this one, and it was a shame to see you didn't like it as much as you hoped to :( The book blogging main character does sound good, but it's saddening to see that so many things seemed to fall flat.